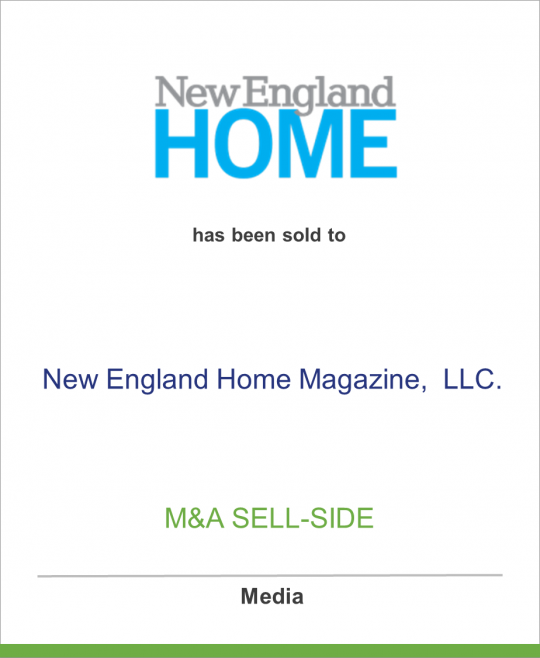 Network Communications, Inc. has sold New England Home and related properties to New England Home Magazine, LLC. DeSilva+Phillips client, Network Communications Inc., has sold New England Home, to New England Home Magazine, LLC. Prior to the acquisition, New England Home was part of the portfolio of home-design brands owned by Atlanta’s Network Communications, Inc. (NCI). Progress Partners, headquartered in Cambridge, MA and New York, NY, is a finance and M&A advisory firm that works with emerging growth companies. Progress acted as financial advisor to the transaction. The New England Home brand is comprised of both print and digital media assets, as well as industry events and awards programs aimed at showcasing the unique architecture, exquisite interior design, and superior custom building that define the luxury home in the six states of New England. The brand’s flagship publication, New England Home, is the leading luxury home magazine in New England and parent publication to other titles including New England Home Cape & Islands and quarterly editions of New England Home Connecticut. The New England Home magazine website (www.nehomemag.com), daily design blog, weekly e-newsletters, and a robust social media footprint connect the brand with design professionals and luxury consumers online. The New England Home brand also originated and continues to organize the New England Design Hall of Fame and Five Under Forty events for the region’s design community. The eighth annual New England Design Hall of Fame awards gala (http://nehomemag.com/ms/new-england-design-hall-fame/hall-fame-boston-ma) will take place this week on Wednesday, November 5, 2014, at the State Room in Boston, MA. New England Home Magazine, LLC is a small group of private investors who have joined forces to drive the growth and expansion of luxury and lifestyle brands. Capitalizing on the success of its lead acquisition of New England Home, the group plans to leverage its media expertise to acquire and strategically grow key brands in targeted regions. Adam Japko is chief executive officer of Esteem Media and a managing partner at New England Home Magazine, LLC, the group of investors that has acquired the New England Home brand and its assets. In September 2014, Esteem Media announced its formation and lead acquisitions of Atlanta Homes & Lifestyles, The Design Bloggers Conference and The Garden Bloggers Conference. Prior to forming Esteem Media, Japko served since 2005 as president of NCI’s Luxury Home Design Division and DigitalSherpa, a leading provider of content marketing and social media management for small businesses nationwide. Under Japko’s leadership, DigitalSherpa initiated and managed content marketing and social media programs for more than 4,000 SMBs since its launch in August 2009. Prior to joining the NCI team, Japko was president and chief operating officer of the Advanced Technology Division at PennWell Media Corp., a business-to-business information provider for the global technology, energy and municipal services markets. Japko also owns and is the blogger behind the award-winning wine-centric blog, WineZag. Chris Legg is a senior managing director at Progress Partners (www.progresspartners.com) and a general partner at Progress Ventures. At New England Home, LLC, Legg leads a group of local Boston-based private investors who collectively have a long and successful track record running and investing in private companies in a variety of industries, including publishing and new media. Together they have decades of experience acquiring, growing and consolidating companies, resulting in 50 liquidity events and acquisitions across the US, Canada and abroad. For more information about New England Home’s offerings both in print and online, please visit http://www.nehomemag.com, or connect via Facebook (http://www.facebook.com/nehomemagazine), Twitter @NEHomeMagazine and Pinterest (http://pinterest.com/nehomemagazine). Sold to New England Home Magazine, LLC.